Is your small business struggling to stand out? It’s time to pump the brakes on your worries. Our creative advertising agency can help you accelerate your brand awareness with a custom-designed vehicle wrap. Vehicle wraps, also known as truck advertising or fleet branding, are some of the most cost-effective advertising tools available. 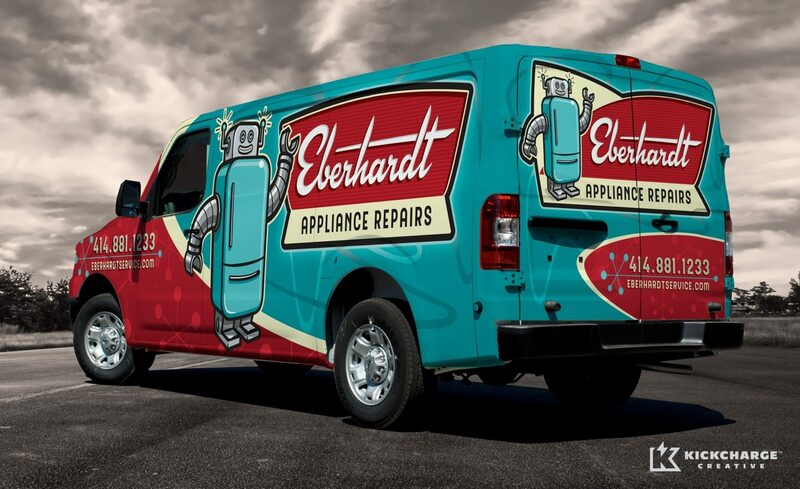 A distinctive, creative vehicle wrap transforms your company’s fleet into moving billboards that connect with customers in a way that no other marketing medium can. So, buckle up and enjoy the mobile marketing ride. For small business owners, branding can be an expensive and time-consuming task. But it doesn’t have to be this way. Investing in fleet branding makes it easier and more affordable for you to get your company’s name in front of your target audience. That’s because, with a custom-designed layer of vinyl installed on the outside of your business’s vehicles, promoting your name becomes as simple as driving around town to and from scheduled service calls. Vehicle wraps transform your fleet of service vehicles into powerful marketing tools. By putting your brand on wheels, your business can pick up tens of thousands of impressions per day. Depending on traffic volume and location, just one of your vehicles has the potential to be seen by 30,000 to 70,000 people each day. Vehicles wraps also broaden your brand exposure across a larger geographical area, reaching a wider audience. This includes customers of all ages, genders, backgrounds, incomes and professions. Fleet branding is effective even when your truck is parked. With your company gaining exposure 24 hours a day, seven days a week, lead possibilities will be off the charts. Best of all, mobile advertising allows your brand to gain traction without revving up costs. In fact, vehicle wraps have proven to deliver the lowest cost-per-impression of any form of advertising, which is why they’re the preferred choice for small and cost-conscious businesses. Cost isn’t the only reason truck advertising is the preferred marketing method for small businesses. Unlike print, TV and radio ads that expire or become dated, fleet branding is evergreen—a single investment that lasts for years. As time passes, a wrap’s effectiveness doesn’t fade, continuing to attract potential customers as successfully as it did the first day your vehicle hit the streets. Plus, with vehicle fleet wraps, you can outfit as many vehicles as your business’s budget allows at the outset. Then, as finances permit, you can add more wrapped vehicles to your fleet. Vehicle wraps have other benefits. The vinyl protects your vehicles from wear and tear caused by road debris and weather, too. Plus, dents or scratches in the vinyl can be repaired instead of repainting the exterior of your vehicle. After you’ve invested in brand name development and a company logo design that distinguishes your business from the competitors, the next step is to make sure it’s visible. A large, eye-catching canvas that traverses your service area is the ideal way to get maximum exposure. If your team isn’t driving vehicles with easy-to-read messaging and a design that turns heads, you’re missing an opportunity—every day. 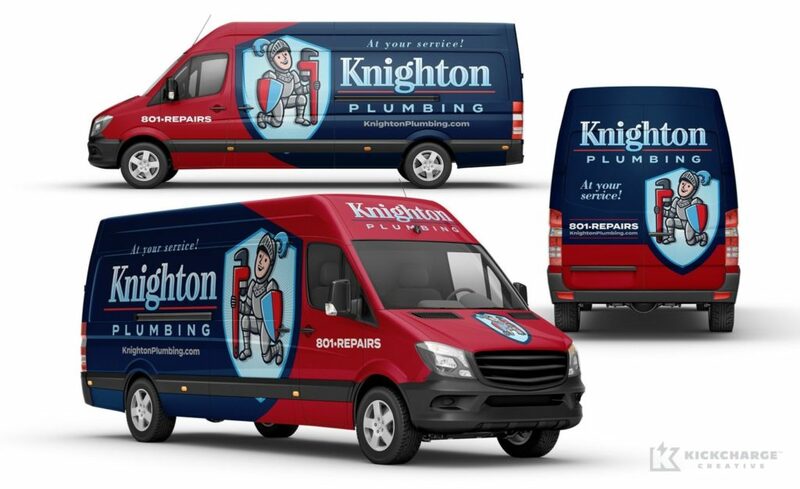 Our fleet branding and truck wrap designs assure your brand gets noticed: capturing attention both on and off the road as part of a comprehensive marketing strategy for contractors. Our clients report that vehicle advertising pays for itself within the first few months—or even days—making this one of the smartest small business or HVAC marketing investments you’ll ever make. KickCharge® understands how important this asset is to your business. With two decades of experience, we know what delivers the best financial return. KickCharge Creative’s wrap designs focus on brand integration and prominence—so they stand out among vehicles covered with meaningless photos and hard-to-read messaging. Browse our portfolio, and you’ll quickly see the difference in how we design truck wraps—and why we’ve become the leading authorities on fleet branding. We apply the same brand-based strategy to create the best web designs in NJ and beyond. 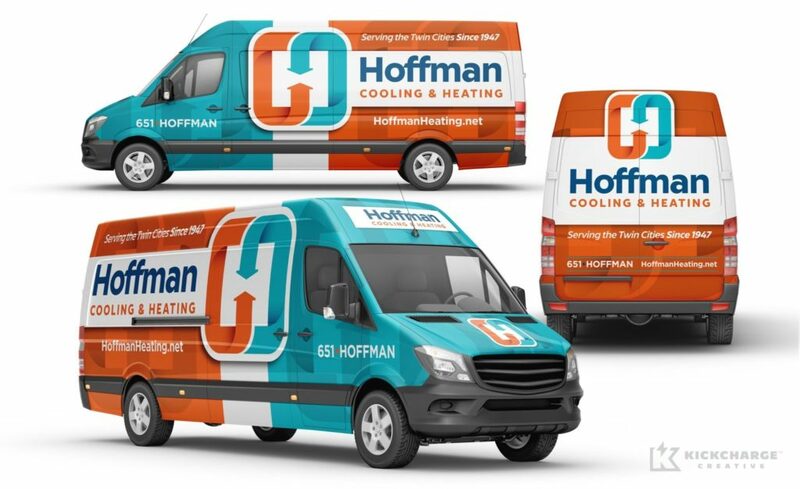 One of our best truck wraps for this HVAC company uses a hand rendered illustration in the design. Their business has seen substantial growth since the introduction of the new brand we created. 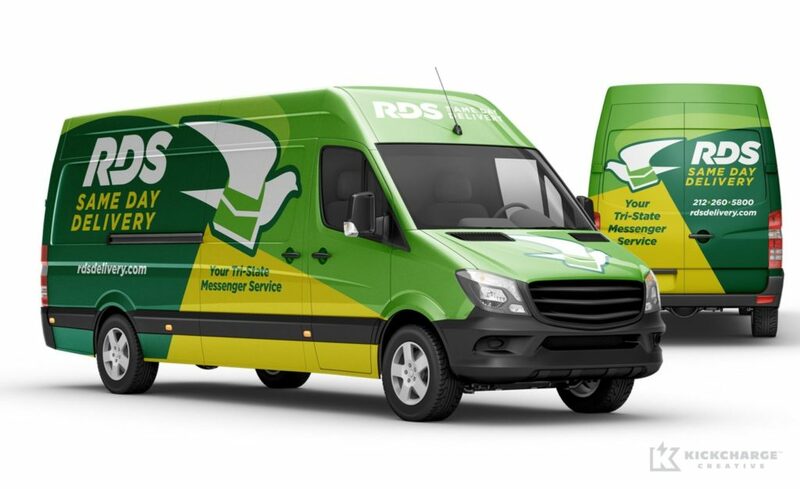 For every service provider, each trip in an unwrapped or poorly designed company vehicle is a missed marketing opportunity. 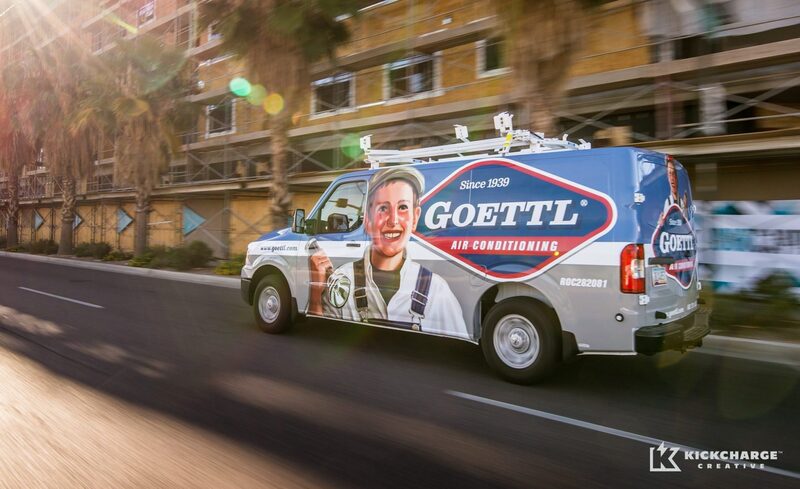 When prioritizing marketing for plumbers or other contractors, take advantage of the captive audience by driving a moving billboard that builds brand awareness and carries a super-sized call to action. For specific measurable results, use a unique call-tracking phone number on your truck wrap to be able to count the phone calls and conversions it generates. The branding and design experts at KickCharge will ensure your truck wrap moves your business in the right direction. What are you waiting for? Step on the gas for fleet branding and mobile advertising by calling 800.836.4666 or contact us online today! KickCharge Creative is not a truck wrap installation company. We handle the design of your fleet branding, by first designing your brand, and then integrating the brand on your vehicle. We can work with your sign company or our network of installers to get your wrap printed and installed.